Mutso (Georgian: მუცო) is one of the former Khevsur strongholds of the historic Georgian province of Khevsureti (now part of Mtskheta-Mtianeti region) in north-eastern Georgia. Its medieval fortified dwellings and towers are arranged on vertical terraces above the Mutso-Ardoti gorge. Recent restoration work by the National Agency for Cultural Heritage Preservation will help to preserve this important part of Georgia’s heritage. The Khevsurs who lived in Mutso were exceptional warriors and Georgian Kings regarded them as reliable guardians of the northern border of the kingdom. Located on a rocky mountain (1880 m) on the right bank of the Andakistskali River (ანდაქისწყალი), the village of Mutso comprises four fortified towers and thirty fortified dwellings that were abandoned more than a century ago. 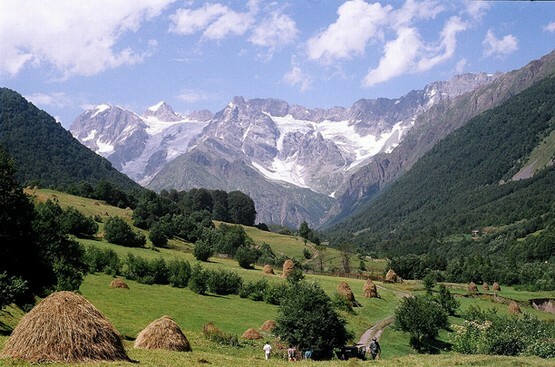 Although difficult to access, Mutso is a popular destination for tourists and mountain trekkers.